Written by Larry Hama with art by SL Gallant, G.I. Joe: A Real American Hero #175 continues to explore who, or what, are the mysterious Blue Ninjas. 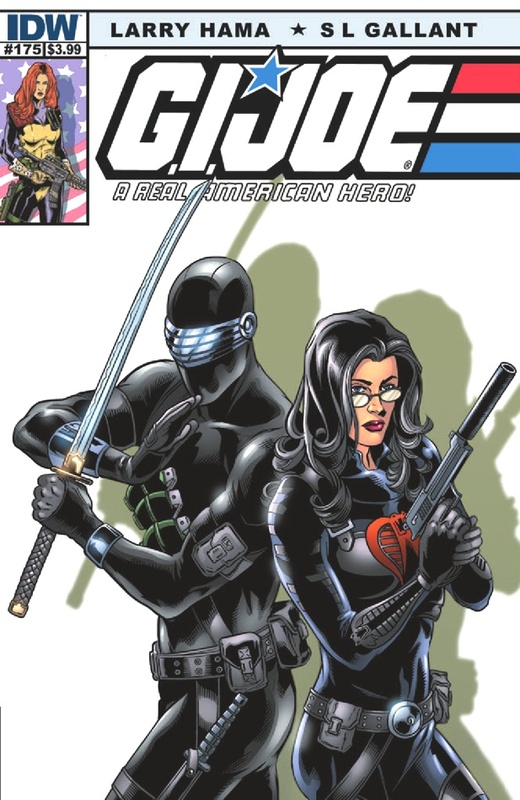 In three separate, but parallel missions, the Arashikage ninjas, Cobra Commander, and the Baroness each pursue leads to enact vengeance against Billy's killers. It's a common Hama trademark to juggle two or three separate plots at once, often resolving one while starting another. Occasionally, those plots can overlap (most recently in the Sneak Peek/Darklon stories). On rare and important occasions (the invasion of Springfield, the Cobra Civil War, the war in Trucial Abysmia), however, he'll tell only one story but with multiple points-of-view. It gives the aftermath of Billy's death a certain amount of gravitas, therefore, that Hama chooses to reveal the Blue Ninjas from three points of view: The Arashikage ninjas (Snake Eyes and Storm Shadow), Cobra (led personally by the Commander), and the Baroness. The narration at the beginning of the issue was a fresh touch. As an android awakens and begins to target the ninjas, two observing guards vocalize both the threat potential of the android and its play-by-play actions. It was a great way to give information to the reader while at the same time keeping the pace moving quickly. The Blue Ninja storyline looks like it will continue for a while, although with Snake Eyes, Storm Shadow, The Commander, and the Baroness each targeting them, it's not hard to guess who will fall at the end. As a ninja-centric storyline goes, this one remains entertaining. I freely admit that when Hama relaunched this series, I was having a hard time liking it. Brainwashed Baroness and Billy, and the tension it placed between Destro and the Baroness was just one of the problems. While I'd just as soon forget that rocky start, I can't fault Hama for acknowledging it, especially when it means putting it to rest. Despite her prominence of the cover, Baroness doesn't have a large roll in the book. Here's hoping that Hama has something huge in store for her in the next issue. I've enjoyed SL Gallant's art from day one, and I still do. He has a clean style that is both beautiful to look at and easy to follow. My only gripe is the character designs. Most of the characters still have their 80-esques uniforms, which looks increasingly out-of-place in the "modern-day" timeframe. I admit it's fun to see Cobra Wolfs and Snow Cats (two of my favorite vehicles) in all their impractical splendor occasionally. And I think that's why the designs are the way the are: to appeal to the nostalgic 80's fanboys that are undoubtedly a large part of the readership. Still, a little modern updating would go a long way. At least have the Baroness wear a uniform that did not have a huge Cobra insignia on it. Favorite moment: Cobra Commander's copter landing on the security van. I love my ruthless, vindictive, puppy-kicking Cobra Commander. Strong continuation of the Blue Ninja story, with promises of more to come. Recommended.